I had undergone a science experiment of my own last Thursday by deciding to make a couple of fruit tarts because I had some old apples and strawberries that needed to be eaten pronto. I checked online for tart crust recipes and ended up with two. One failed me, the other didn't. I'm posting the better of the two recipes in this blog entry. If you've made a tart crust from scratch, you'll know that it can get pretty scientific. You have to use super cold butter along with ice cold water. You can't overwork the dough and you have to chill it before rolling, etc., etc. One or two mistakes will spell disaster, giving you hard, non-flaky tart crusts. The failed recipe made me roll out the dough before chilling. The other (which I find to be a more common, or traditional method) called for chilling the dough first then rolling it out. Given the contrast in results, I'm sticking with the winning recipe from now on. It wasn't quite perfect but it was pretty darn good. It was soft and flaky, as it should be. Coincidentally, last Thursday was also Family Science Night at my daughter's elementary school. A few teachers had pitched in with their own funds to put together a fun-filled night for the students, all in an effort to encourage more interest in the subject. Our world definitely needs more Einsteins, don't you agree? We had a nice time at Science Night. 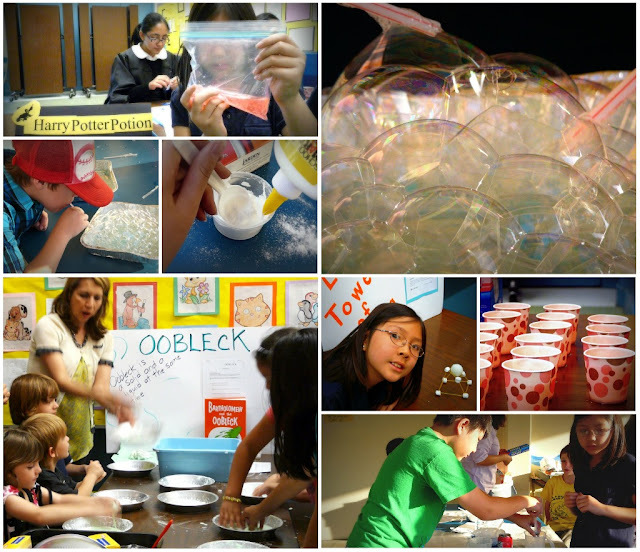 Each teacher who participated hosted one, two or several tables with simple but fun experiments. Interestingly, almost each experiment involved some type of cooking ingredient. One experiment encouraged them to think about form and function by using mini marshmallows and raw spaghetti to build a structure. Another experiment encouraged the kids to record the kind of reactions they see when they mix baking soda with different liquids like soda, water, or vinegar. My favorite was the Oobleck table. Just a simple combination of cornstarch, water and food coloring and you'll have yourself some fun slime. It just goes to show, science is everywhere in the kitchen. Makes two small tarts or one large tart. Mix the flour and salt in a food processor by giving it a few quick whirls. Add the cold, cut butter and pulse until you get a course mixture. Next, add the cream and cold water and process until the mixture starts to come together. You'll most likely need to add more ice water than what the recipe calls for as did I. Just add enough water for the dough to come together but not for it to be too sticky so add one tablespoon at a time until you get the right consistency. Gather the dough into a ball and flatten into a disc. Wrap in plastic and chill for about an hour. After the dough has chilled, remove from plastic and let soften a little at room temperature before rolling. Turn it out onto a floured surface. If making two smaller tarts, cut the dough in half. Roll one half of it out with a floured rolling pin to a thickness of about 1/8" and into a rounded shape. Transfer to a large baking sheet lined with parchment paper. For the filling, toss the fruit and sugar in a bowl. Arrange the sliced fruit in the center of the dough, leaving at least 2-inches around the border. 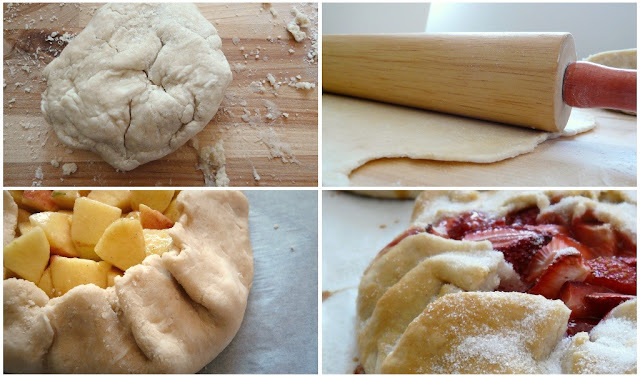 Fold the edges of the dough in and over the fruit, forming large pleats as you go along. Brush the dough lightly with beaten egg and sprinkle more sugar over the fruit before popping it into the oven. Bake for about 45 minutes or until the crust becomes golden brown.